All-world Ashley Owusu (the old) drives by transfer addition Lee Volker (the new) at a recent Paul VI practice. It’s business as usual for Paul VI, which has won 12 straight state titles and has been slotted #1 in the novahoops.com rankings for as long as we’ve been a website. 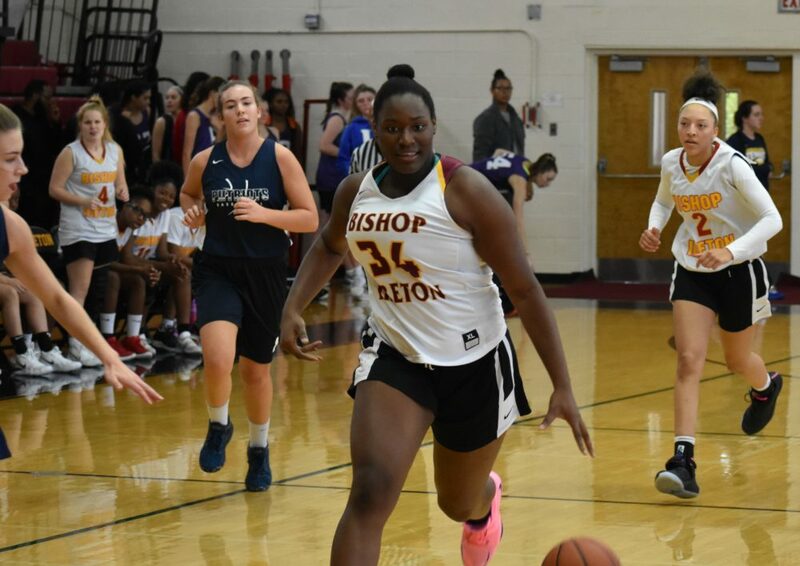 The Panthers did lose a lot from last year’s team–namely Amira Collins, Kate Klimkiewicz and Christina Green to graduation, and Konnor Gambrell (Bishop Ireton) and Aurea Gingras (Edison) to transfer. But there’s more than enough talent on hand for the Panthers to claim another state title and challenge for the top spot in the loaded WCAC. A big reason for that is of course Ashley Owusu, who we still can’t believe hasn’t graduated yet. Owusu was absolutely dominant as a junior last year–perhaps the region’s top player overall regardless of class. The Maryland Terrapin commit is a player who can handle the ball comfortably on the perimeter as well as dominate on the block. She’s got great size and will draw entire defenses her way, even if teams concede giving open looks to the many other dangerous Panthers players. Last year she averaged almost 20 points a game and absolutely amazed people with a 39-point performance against a stacked Manasquan (NJ) team in January. Forget the region–she may be the top player in the country this year. Owusu can bring the ball up the court as a point forward, but coach Scott Allen understandably wants others to handle the ball so Owusu can get looks off screens and sets. While the Panthers lose Gingras, they gain sophomore transfer Lee Volker from Loudoun Valley. Volker is a tall guard with handles who already has Division I scholarship offers. In the backcourt Allen also has sophomore guard Isabella Perkins, who gave him some key minutes as a freshman in some important games last year. She’s dealing with a torn meniscus suffered over the offseason but should be ready to go sooner instead of later. Junior Faith Alston returns as well–she started at point guard in the WCAC Championship last year and looked anything but overwhelmed. So when the ball is out of Owusu’s hands, the Panthers should be just fine running offense. 6’2″ junior Sydney Avoletta is back. She’ll be key for the Panthers to compete on the boards in the rugged WCAC. So is sharp-shooter Elizabeth Thibodeau. Hannah Herzog, Meghan Kenefick, Jennifer Hayes–the names go on and on. 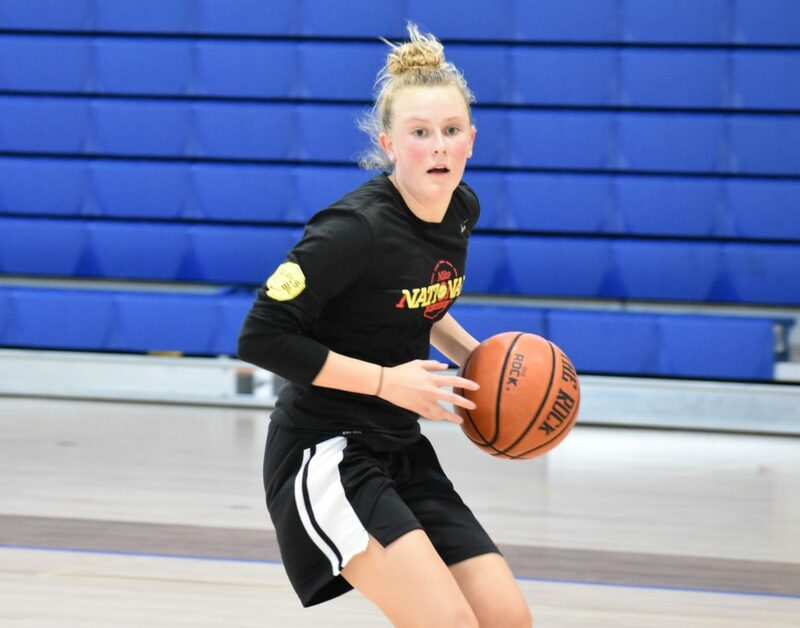 Oh, there’s also a fantastic freshman class on campus with talent like Alyssa Costigan, Jaelyn Talley and Fiona Hastick, all of whom who played on the almost unbeatable Vogues 2022 AAU team. The present is bright as well as the future for Allen. While Allen is very optimistic about his squad, he is very cognizant of the threats he faces in the WCAC. Bishop McNamara and St. John’s should be nationally-ranked teams, and so might be Bishop Ireton. The Cardinals gave PVI all it could handle in a photo finish at the state title game in Richmond last year and figure to be a tough out again this year. 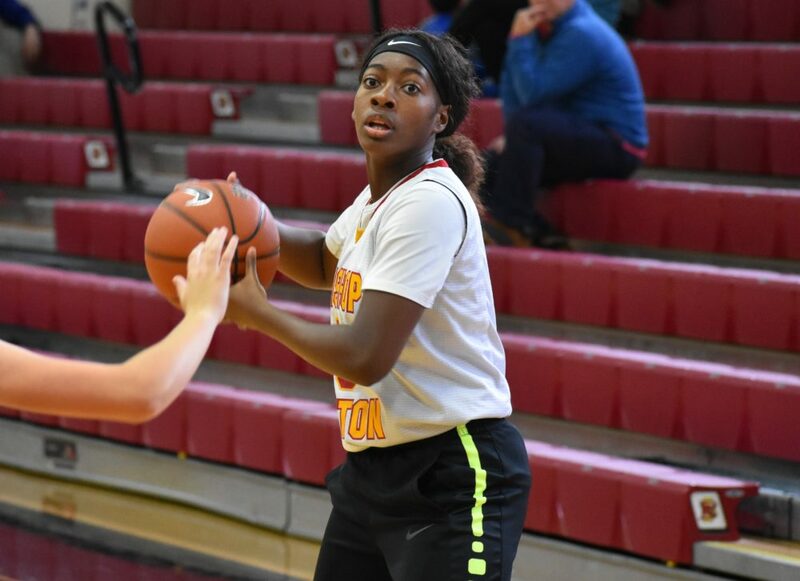 BC-signee Akunna Konkwo returns to lead Ireton’s quest for success. Coach Jason Harris accepted a coaching job at North Carolina Central in the offseason, but the Cardinals were absolutely thrilled to land a close friend of his to take over the program. That would be veteran head coach Kesha Walton, who comes over after over a decade of experience at nearby T.C. Williams. What a score that was for Ireton, which shouldn’t now miss a beat. Whatever changes Walton makes you can bet the offense will still flow around center Akunna Konkwo. A natural center, the 6’4″ Konkwo committed to Boston College this summer after averaging around 19 points a game and 15 rebounds a game last season. She’s a ridiculously strong force down low who is also comfortable in an up-tempo game should Walton choose to go that way. Whatever the case, the vast majority of opposing defenses will have to game plan to limit Konkwo first and foremost. Good luck with that–even when other players shoot she’s a constant threat to grab an offensive rebound and score that way. Walton had great depth with a title contender at T.C. Williams last season but might have even more depth this year across town at Ireton. Seniors Sydney Peters and Symantha Shackelford both return after coming close to averaging double figures last year. Both can shoot, and figure to continue to get good looks from the arc with defenses sagging down low on Konkwo. Between them they sank almost 150 treys last year and that total may go up. The Cardinals can come at you in waves, and Laila Jewett will have a big role running the show. The Cardinals lost Taylor Napper and Chi Irondi from last year’s heralded freshman class, but Walton retains the services of the rest of that group to include highly regarded point guard Laila Jewett. There’s another great freshman class on hand plus a few more experienced returnees from last year, like forward Kylah Franklin. Oh, and if that wasn’t enough, a couple of players from the T.C. Williams program joined Walton at her new school, plus guard Jazreel Reynolds from O’Connell. Gambrell came over from Paul VI as well. If healthy, she could team with Konkwo to form a very formidable front line, but she is dealing with a knee injury that may severely impact her season. Even if Ireton doesn’t have Gambrell expect the Cardinals to again challenge PVI for a state title in March. Don’t sleep on O’Connell. While lacking the senior superstar power of an Owusu or a Konkwo, coach Aggie McCormick-Dix again has a very solid squad that is capable of winning in the WCAC. Last year the Knights finished ahead of Ireton in the standings, and they have the potential to make noise again. After getting most of their production from Brie Perpignan and the other senior guards last year, the Knights figure to need more frontcourt production this year. They should get it out of a group that is athletic and talented. Forward Ajia James was an all-novahoops.com sophomore selection last year. She’s a fantastic athlete and a great rebounder who can impact the game without having to score too much. She’s joined by crafty small forward Anna Hovis in the frontcourt. Hovis can run the floor and attack the rim and is capable of getting tough points when her team needs it. She should average around double figures this year. McCormick-Dix landed a big transfer in sophomore forward Adrianna Smith. At South Lakes last year Smith was often dominant even as a freshman. She can run the floor, rebound and shoot the mid-range shot with ease. 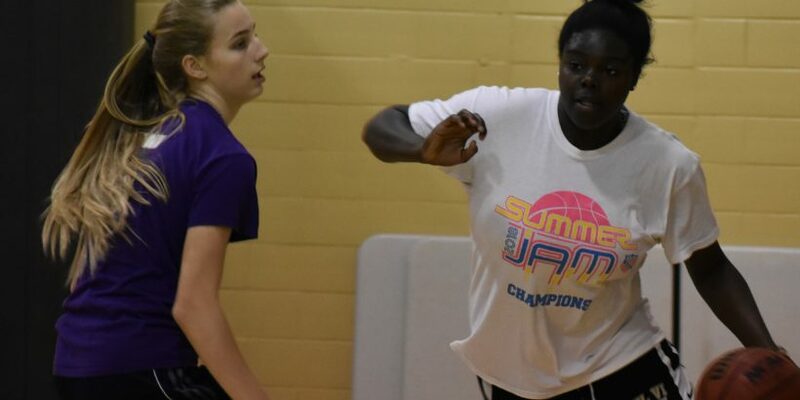 While she’ll no doubt find the WCAC challenging, Smith appears ready physically and mentally to have a big impact. It helps that her and Hovis are able to play big guard as well, since O’Connell will often need to trot out fairly big lineups in the WCAC. That’s why returning forward Simone Edmundson is also key. She’ll need to deliver on the boards for O’Connell to have a chance to upset the league powers. We don’t think O’Connell’s Maura Leverone gets the recognition she deserves. A lot of scoring punch may have graduated out of the backcourt but the talent is there to replace a lot of it. Freshman Aaliyah Carlock is on board and will immediately contribute. She comes from a family dripping in local basketball tradition. Senior guard Maura Leverone is probably one of the most under-appreciated talents in the area. The lefty can shoot and is smart enough to know when to get to the rim and try and draw contact. While others may get more accolades, in wouldn’t surprise us at all to see Leverone lead the team in scoring on a lot of nights. She’ll have to expend a lot of energy setting up the offense, though. Junior Mikaela Brunais is another transfer addition who will provide depth in the backcourt. She’s a fantastic passer and a hard-worker. If she can step up and give the Knights depth that will help a lot. O’Connell looks to be a good free throw shooting team that can stand toe-to-toe with national powers on certain nights. Stay tuned. The young lady in the second Ireton photo is Laila Jewett not Kylah Franklin.